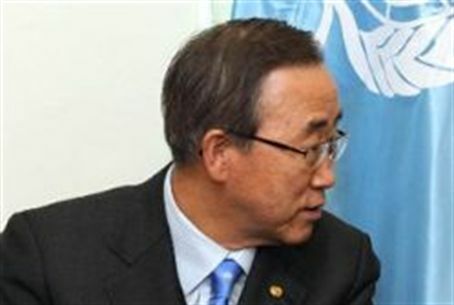 UN secretary general Ban Ki-moon says Israel's plans for a new community in southern Jerusalem "must cease." UN Secretary-General Ban Ki-moon criticized Israel on Friday over reports it plans to build a new community at Givat HaMatos in southern Jerusalem, saying further Israeli construction was "unacceptable." "The Secretary-General is deeply concerned at continued efforts to advance planning for new Israeli settlements in occupied East Jerusalem," Ban's office said in a statement. "Recent developments in this regard have been unacceptable, particularly as efforts are ongoing to resume (Israeli-Palestinian) negotiations, and run contrary to the Quartet's call on the parties to refrain from provocations," it said. "The Secretary-General reiterates that settlement activity in East Jerusalem and the remainder of the West Bank is contrary to international law," the UN statement said, adding such activity "must cease." The Peace Now group complained on Friday that Israel planned to build the housing units in a new urban settlement – the first to be approved in 14 years – that will effectively cut Jerusalem off from Arab villages in neighboring Judea and Samaria. At present, Givat HaMatos is a community of Ethiopian Jews living in caravans on 170 dunams of land. Under the new development plan the current community will be removed in favor of building some 4,000 housing units on 1,060 dunams of land. Another report said 2,400 units would be built. The diplomatic Quartet for Middle East -- the United States, Russia, the European Union and United Nations -- has urged Israel and the PA to resume peace talks under the bilateral Oslo Accords without preconditions with the goal of reaching a final status agreement by December 2012. PLO officials have demanded Israel cease construction in areas of Judea, Samaria and Jerusalem that are defined as 'disputed territories' under international law, and recognize the pre-1967 borders as a basis for talks, before they will return to the negotiating table. However, Israeli officials say a previous 10-month building freeze implemented to meet PA chairman Mahmoud Abbas' demands for talks failed to bring PA negotiators to the table and was only met with more preconditions. Instead, Jerusalem says, talks should resume according to the Quartet's latest proposal with all reservations being discussed during negotiations. The Quartet last week proposed talks resume in Jordan on October 23, but PLO officials say they will not attend. The current Quartet proposal came in response to PA chairman Mahmoud Abbas' unilateral bid for statehood outside the established framework of the Olso Accords at the United Nations in September. Abbas' application for statehood must receive at least nine positive recommendations from the 15-member Security Council, including all five permanent members, before being passed to the General Assembly for a vote. The United States has promised a negative recommendation for the application rendering it a dead letter that US secretary of state Hillary Clinton says "is going nowhere." US officials maintain the "road to a Palestinian state runs through Jerusalem and Ramallah, not New York." US lawmakers froze some $200 million in aid the PA in the wake of the bid and have said they will also move to freeze aid to any United Nations organ that recognizes a PA state before a bilateral agreement is signed with Israel.